bank nifty bullish after strong come back in rupee today close above 61.52 level with strong 0.38 paise, nifty close above 6263 and bank share 11021. 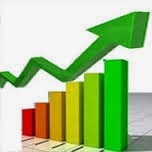 IT SHARE bullish trend today, infosys, tcs, hcl, wipro,financial tech, persistent increase 4% to 2%, while bank share SBI, kotak bank, icici, bank of india, hdfc, axis bank increase 2.5% to 2%. auto share tata motors, apollotyres, m&m, gaines 4% to 1%. while ranbaxy top losers today. I really thanx by this blog posting. Thanks for gave us profitable services and calls.